Back in 2012 Delta Air Lines began quietly testing fares at similar pricing points to those of Spirit Airlines, a US ULCC that was gaining traction in the market place, especially among investors. By 2014 that product had developed and manifested as the now well-known Basic Economy, part of Delta’s suite of branded fares unveiled by the airline in late 2014. Basic Economy was dubbed by some observers as the 'Spirit-killer', but Spirit’s fall from investor grace in 2015 stemmed more from overall soft pricing in the US domestic market. However, the branded fare concept became increasingly popular in the industry business as a means by which larger US network airlines could compete effectively with their ultra-low fare rivals. The introduction of more segmented fares should actually allow American, Delta and United to add more sophistication to their revenue management and avoid dilution of revenue; these fare products aim to create pricing segments which cater to a wide swathe of passengers. To its credit, beginning in 2012 Delta had the foresight to start slowly matching certain fares offered by Spirit. At that time Spirit was rapidly expanding, touting its theoretical strategy that it was stimulating just enough traffic in markets where it competed with the majors to be able to cover its flights; therefore, the major airlines such as American, Delta and United essentially ignored Spirit’s pricing activities. During the last couple of years holes have appeared in that theory as US majors, American in particular, have concluded that they do need to pay attention to Spirit. Although Spirit represents just 1.6% of US domestic seats for the week of 7-Mar-2016 to 13-Mar-2016, its impact on the market place is much broader. In 2015 American set out to explain the effects of the ULCC business model in the US market. At that time the airline stated that approximately 87% of its customers during the last year had been travelling for the first time, and that particular passenger pool represented 50% of the airline’s revenue. The company also stated that approximately 85% of US domestic pricing was influenced by low cost airline price points. American has now stated its intent to create a branded fare product that includes an option similar to Delta’s Basic Economy. Prior to the merger between American and US Airways, American created a 'Choice' branded fare offering, but it was somewhat different from the four-tiered Delta fare package that debuted in 2014. In 2H2016 American aims to launch a price offering that includes a basic economy option, which is essentially the cost of the air ticket; anything extra beyond that is an add-on item for which the customer is charged. During early 2016 American highlighted its excitement about the new product, noting that it could be as significant a change for the industry as the ancillary product movement, which started full-force in the US market in 2008. However, the company stated that it would not benefit from a meaningful revenue impact from its branded fares until 2017. In early 2016 United acknowledged that pricing segmentation was an increasingly important tool in revenue management. “The more we segment our fares, the better opportunity we have to minimise revenue dilution”, said the company chief revenue officer, Jim Compton. The airline rolled out the first phase of its branded fares in early 2016 and it entailed offering customers a collection of products, instead of more à la carte offerings. During 2H2016, United plans to introduce a fare directly appealing to the price-sensitive customer. Mr Compton again emphasised that price segmentation would avoid “some levels of revenue dilution built into our pricing structures today”. In early 2016 Delta was queried about the size of the revenue tailwind from curtailing the business traveller who otherwise might be buying lower fare types. The company's view was that there was more of an indirect benefit from Basic Economy Fares, but it estimated that the benefit from the undiluted revenue could be in the several hundred million dollars per year range. The Basic Economy product is available in 1,020-plus Delta markets. Delta’s Branded fares – Main Cabin, Basic Economy, Comfort Plus and Delta One/First Class – are on track to generate USD2.4 billion annually by 2018, compared with USD1.2 billion in branded fare revenue for 2015. Previously, Delta had estimated that branded fares would generate USD1.5 billion by 2018. Perhaps the enlarged estimates are part of Delta’s efforts to make purchasing branded fares easier for customers. Beginning in May-2016 the fare options will be available in the purchase path. Company executives have also stated that the intent is to make the products easier to purchase, through Delta’s own channels as well as via Global Distribution Systems and online travel agencies. Although the potential for branded fares is in the billions of annual revenue for the three large US global network airlines, it does create more complexity in the methods they use to price fares. At the end of 2015 Delta chief revenue officer Glen Hauenstein (the new President of Delta, effective May-2016) explained that before the creation of branded fares – and the technology to sell those products in the purchase path – there was a hierarchy of price fencing, including mandatory stays and advance purchases. Now, said Mr Hauenstein, there is a third dimension of pricing, which is “what product do you want to buy within each fence?” The company’s pricing team now has to ensure that they maintain the proper fencing, and that they do so for multiple cabins. Delta’s pricing experts also need to prevent inversions, where a Basic Economy price can potentially end up higher than a Main Cabin fare because of inventory controls. Although branded fares are still a fairly new concept at Delta, the airline does have some data to draw from in order to determine the customer response to the tiered structure. At YE2015 the airline estimated that it wins an upsell from Basic Economy between 50% and 60% of the time. Mr Hauenstein stated that Basic Economy was not driving huge volumes itself; it was more of a defensive play to compete with ULCCs. Delta has started rolling out branded fares in international markets and believes that Basic Economy fares should be available in all of the airline’s markets by YE2016. Commenting on some lessons learnt from the Basic Economy roll-out Mr Hauenstein stated that although Delta built the bare bones fare level as a form of defence, the airline predicts broader applications for Basic Economy in markets where competition with ULCCs does not exist. In late 2014, as Delta was preparing for the roll-out of its own new branded fares, company management took the opportunity to highlight that Spirit was not the most on-time airline, nor did it offer the pitch that Delta offered in economy. Spirit’s economy seat pitch is the tightest among US airlines, at 28in. (It also offers four “Big Front Seats” with a 36in pitch). The point was that Delta’s product was superior to Spirit’s offering. “If your choice is to buy Spirit or to buy Delta, or buy an ultra-low [fare], we will always have the best product”, said Mr Hauenstein. With the Basic Economy product developed by Delta and the similar offerings in development by competitors American and United, ULCCs do face a challenge if they do not drive operational excellence and improve their customer service. These branded fare products are not simply price matching; they are sophisticated revenue management and pricing tools, appealing to a wide range of customers. Customers will ultimately migrate towards a more reliable airline if they are able to find fares similar to those charged by ULCCs. 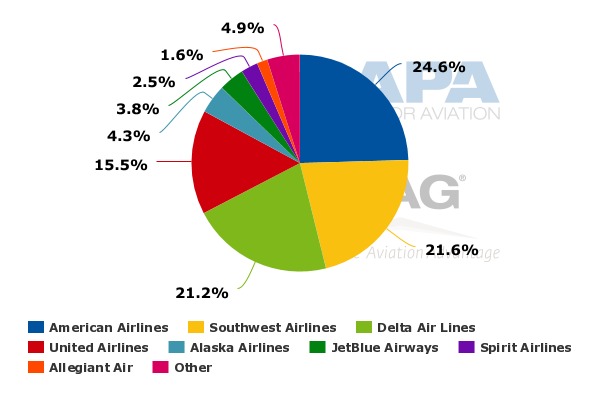 Data from the US DoT show that for the 12M ending Nov-2015, Delta’s on-time performance was 86.3%. Data is not available for Spirit for that timeframe (Spirit only began reporting its data to DoT in Jan-2015), but its average on-time performance for the first three quarters of 2015 was 67.2%. By Oct-2015 Spirit had improved its on-time performance to 78%, and 75% in Nov-2015. American and United’s on-time performance figures for the 12M ending Nov-2015 were 79.9% and 77.7%, respectively. Spirit's new CEO, Robert Fornaro, was appointed in early 2016 and has stated that as larger airlines begin to match the airline in price, the company’s operational performance will improve. Mr Fornaro explained that the basic economy fares offered by those airlines actually create less price competition, due to the fact that larger airlines are not diluting “half their airplane”, rather they are limiting those fares to a certain percentage of the market. Indeed, the three large US major airlines are crafting more sophisticated techniques to compete with ULCCs, which entail less revenue spill. ULCCs are a necessary force in the US market place. Their proliferation, in some respects, has arguably forced the large US major airlines to zero in on their pricing and revenue management to maximise value and minimise costly dilution, which takes on increasing importance in the current environment of soft US domestic pricing. True branded fares offered by the US majors that cater to a wide passenger segment are still in their early phases, but the dynamics created by that segmentation should unfold during the next 24 months, triggering some changes to the current competitive landscape.